The Maserati Quattroporte is a luxury four-door sedan made by Maserati of Italy. There have been five generations of the car, each separated by a period of roughly five years. In the early 1960s, Maserati's reputation was at a high. With growing sales, Prince Karim Aga Khan ordered a special Maserati 5000 WP, chassis no. 103,060, designed by Pietro Frua. The following year, Maserati showed the first-generation Quattroporte of 1963, which bore a striking resemblance to the earlier drawing. Also designed by Frua, the 1963 'Tipo 107' Quattroporte joined two other notable grand tourers, the Facel Vega and the Lagonda Rapide, which could comfortably do 200km/h on the new motorways of Europe. However, the Quattroporte could be said to have been the first car specifically designed for this purpose. It was equipped with a 4.1 L (4136 cc/252 in³) V8 engine, producing 256 hp (SAE) (191 kW) at 5,600 rpm, and either a five-speed ZF manual transmission or a three-speed automatic. Maserati claimed a top speed of 230 km/h (143 mph). Between 1963 and 1966, 230 examples were made. In 1966, Maserati revised the Tipo 107, adding twin headlights (already on the US model) and, from 1968, a 4.7 L, 295 hp (SAE) (220 kW) engine. Around 500 of the second series were made. Production stopped in 1969. In 1971, Karim Aga Khan ordered another special on the Maserati Indy platform, given the reference code AM 121. In 1971, Karim Aga Khan ordered another special on the Maserati Indy platform, given the reference code AM 121. In 1974, at the Turin Show, Maserati presented its Quattroporte II (Tipo 123) on a Citroën SM chassis, since Citroën had purchased the Italian company. It had an angular Bertone body, fashionable at the time, and was the only Maserati with a hydropneumatic suspension and front wheel drive. However, the 1973 oil crisis had intervened and demand for such cars disappeared. Furthermore the technical backbone didn't convince the customers. Maserati made 13 Quattroporte IIs, 6 of them originally were pre-production models and the other seven were built to order between 1975 and 1978. Considered a "business man's Maserati," the Quattroporte III was launched by newly empowered Maserati chief Alejandro de Tomaso and his design staff in 1976. This was a rear wheel drive car, powered by a large V8 engine. It was important to de Tomaso that there was an Italian vehicle to compete with the recently launched Mercedes-Benz 450SEL 6.9. There were 1876 Quattroporte III's produced between 1979 and 1988. There were 1821 standard 4portes manufactured between 1979 and 1984. The remaining 55 cars were all Royales and were manufactured between late 1984 and 1988. These were the US$80,000 cars that were built to order only. The Quattroporte III marked the last of the hand-built Italian cars for specialized markets. All exterior joints and seams were filled to give a seamless appearance. 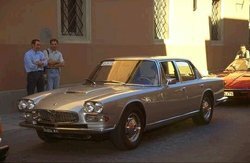 In 1976, Giorgetto Giugiaro presented two ItalDesign show cars on Maserati platforms, called the Medici I and Medici II. The latter in particular featured hallmarks which would make it into the production of the third-generation Quattroporte. By the end of 1976, Maserati announced the Quattroporte III (Tipo AM 330), which took much from the Medici show cars, based on Maserati's Kyalami coupé, which in turn was based on the De Tomaso Longchamp. In 1976 the Quattroporte III was launched as "4porte" with a 4.2 L engine producing 251 hp (SAE) (187 kW), later 238 hp (SAE) (177 kW). Also available was a 4.9 liter V8 (280 bhp @ 5800 rpm). One distinguishing characteristic of the vehicle was its lavish interior. The car was designed by Giorgetto Giugiaro of coachbuilder ItalDesign. In 1979 the Quattroporte got its true name back and was built with the 4.2 L and a new 4.9 L engine 278 hp (SAE) (207 kW). The latter initially had a three-speed Borg–Warner automatic transmission, soon replaced by a Chrysler Torqueflite gearbox. The smaller engine was phased out in 1981. In 1986, the Maserati Royale, an ultra-luxury version of the Quattroporte III, appeared. The engine was upgraded to 295 hp (SAE) (220 kW). In all, 2,141 Quattroporte IIIs were produced, one of them for Italian presidential use. Production ceased in 1990. The 4-door Biturbos such as the original 425 weren't aimed at the same customers as the big Quattroporte I, II and III. All 4-door Biturbos carry the figure "4" in their model name and are based on the 2-door Biturbos with an extended wheelbase. They were available in various "tastes": 11 different models each equipped with a different version of the V6 Biturbo engine (2.0 L, 2.5 L and 2.8 L). Besides being fairly successful as a general model some versions are extremely rare, e.g. the 4.18v was built 77 times and sold solely in Italy. 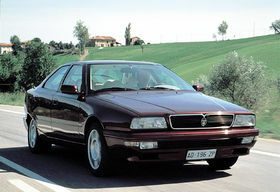 The 4-door Biturbos were the only sedans available from Maserati between 1990 and 1994 and in several markets even between 1986 and 1994 (where the Royale wasn't sold due to emission problems). The 430 4v was the last version of the 4-door Biturbos. The some technical elements and design were used for the Quattroporte IV. At the height of Fiat's styling prowess, Maserati was confident to be more adventurous with Quattroporte IV from 1994. Designed by Marcello Gandini, who had penned the Lamborghini Countach, the new car was smaller, very aerodynamic (0.31 cd), and featured Gandini's trademark angular rear wheel arch. A 2.8 L Biturbo V6 was installed, producing 284 hp (SAE) (208 kW), reaching a top speed of 255 km/h (158 mph) while the Italians even had a 2.0 L Biturbo V6 producing 287 hp (SAE) (211 kW) on their price list, both coming from the Maserati Biturbo engine catalog. A V8 3.2 L Biturbo was announced in 1995, coming from the Maserati Shamal, developing 330 hp (SAE) (246 kW) and reaching 263 km/h (163 mph). When Ferrari took over Maserati, it introduced a Quattroporte Evoluzione in 1998. It featured 400 different improvements to Maserati standards of manufacturing. This improved model saw the famous oval Maserati clock disappear from the interior. Production stopped in 2000. Interior of a Maserati Quattroporte Executive GT. In 2004, Maserati started production of the Pininfarina-designed Quattroporte, with the same 4.2 L engine as the Coupé, Spyder and the new GranTurismo but improved to 400 hp (SAE) (298 kW). Due to its greater weight than the Coupé and Spyder, the 0-60 mph (0-96 km/h) time for the Quattroporte is 5.2 seconds. The Quattroporte was unveiled to the world at the Frankfurt Motor Show on September 9, 2003 and made its US première at the 2003 Pebble Beach Concours d'Élégance. 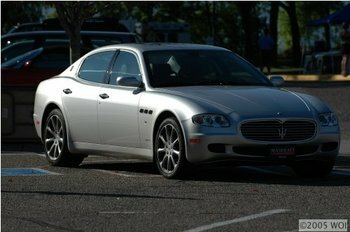 It is a continuation of the long tradition of Quattroporte luxury sedans in the Maserati line-up. The 47% front / 53% rear weight distribution (with the DuoSelect transmission) allows the large sedan to have very nimble handling. This weight distribution is achieved by setting the engine further back in the chassis behind the front axle to shift the load back towards the cabin, and the adoption of the Transaxle layout which sees the gearbox rear-mounted in unit with the differential. The transaxle architecture is normally reserved for high performance sports cars and is the first time applied to a luxury sedan. The Quattroporte's weight distribution maximizes traction and thrust during acceleration so that the car remains exceptionally stable and well balanced at all times. With the newer automatic transmission, the transmission is adjacent to the engine and weight distribution changes to 49% front / 51% rear. The Maserati Quattroporte is offered in four configurations: the base Quattroporte, the Quattroporte Sport GT, the Quattroporte Sport GTS, and the Quattroporte Executive GT. The Sport GTS version of the Quattroporte was introduced at the Frankfurt Motor Show in September of 2007. It features a revised suspension, 20 inch wheels, and larger rear tires for improved handling. The brakes received iron/aluminum rotors for greater fade resistance. Various interior upgrades include alcantara and carbon fiber accents. The Executive GT version of the Quattroporte was introduced at the North American International Auto Show in January 2006. It is based on a special Neiman-Marcus version, with 19in ball-polished wheels and an Alcantara suede interior roof lining. Other features include chrome side and front grills and a wood-trimmed steering wheel. Included standard on the Executive GT version is a Maserati comfort pack with ventilated, heating, massaging rear seats, retractable wood rear tables, and curtain shades on the rear windows. The Duo Select transmission was available at the launch of the fifth generation Quattroporte, in 2004. Duo Select was an advancement of the CambioCorsa unit first used in the Maserati Coupe. It is a semi-automatic transmission, located at the rear of the car. 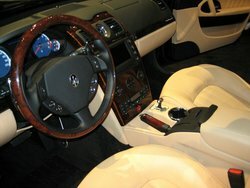 A full automatic transmission with 6 speeds (by ZF) was presented at the Detroit Motor Show in January 2007 with the first cars delivered right after the launch, marketed as the Maserati Quattroporte Automatica. The Automatica will be available with paddle-shifters on the Sport GT model as standard, but on the base model and the Executive trim levels paddles will be an optional extra. The Automatica uses a wet sump oiling system and the transmission is located directly behind the engine, as opposed to a dry sump and a rear-mounted transmission used on Duo Select models. The wet sump method is also featured on the up-and-coming Maserati GranTurismo. Only 5,700 Quattroportes were made in 2006. In 2009, the Aston Martin Rapide will be the Quattroporte's main rival as the market, trim, and exclusivity will be very similar, although it will be powered with a V12 engine and will be much more expensive. Also in 2008/2009 the Porsche Panamera will be on sale, creating more competition to the high-end luxury saloon segment. 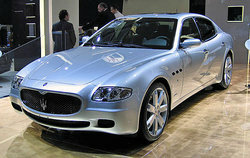 Images of the 2009 Facelifted Quattroporte appeared on the Internet on the 30th of January 2008. The car is expected to make its official début in early 2009.